For our budget conscious customers or those interested in a long stay with us, our Kajama bandas have been entirely rebuilt in 2011. You will find them more confortable and better appointed, with even solar power. 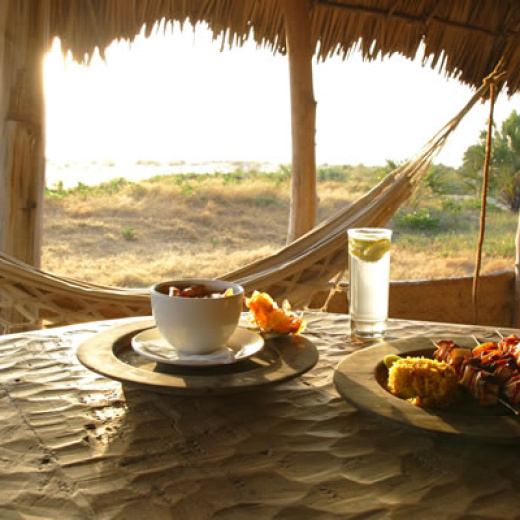 Kajama bandas are per person per night, including full breakfast. 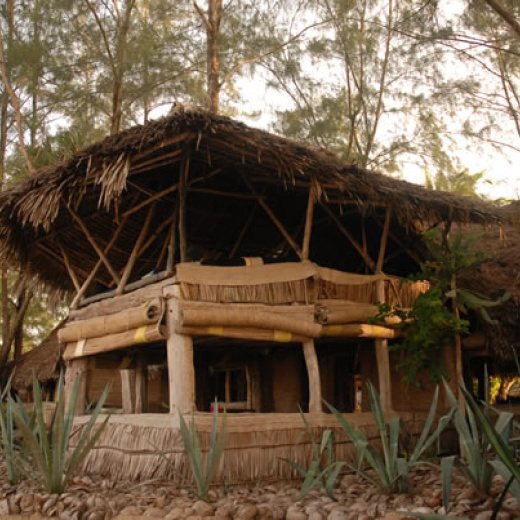 Each Kajama banda is built on stilts and tucked in the doum palms. In your banda you will find one double bed with a mosquito net, a mirror, a large lockable box, and a covered veranda with a table and two chairs. 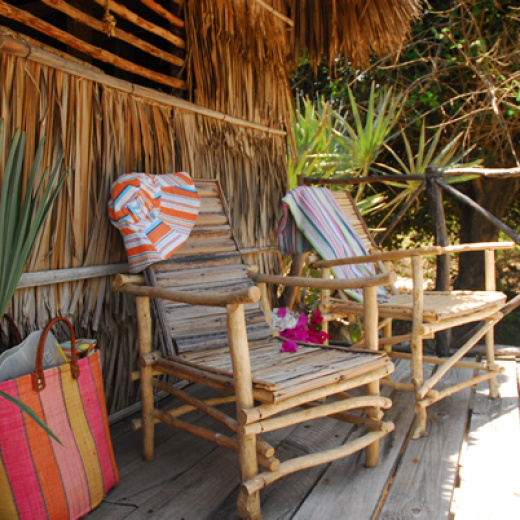 Kajama customers are steps away from the beach (we counted about 30 steps to be exact!). Showers, sink area and toilets are shared with the other Kajama guests and are located behind the bandas. You will enjoy the same facilities and lounging areas as our Che Shale clients, as well as take your meals in our main restaurant. Che Shale’s style is very unique with bandas and restaurant built with renewable local materials such as Casuarina trees, palm trees, dune palms, coconut fiber, mango wood and other local woods. Furniture, fittings and accessories have been carefully crafted and designed to give the natural setting a slightly contemporary feel. What makes Che Shale so unique is its style. Che Shale has been styled by acclaimed Milan furniture and interior designer Marzia Chicherretti. Marzia’s style has been described as tropical contemporary, her furniture is hand made in Kenya using homegrown materials and locally-trained talent. 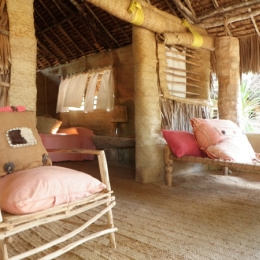 Under our large palm thatched roofs, oversized cushions and comfortable daybeds invite to relaxation. In your room you will find unique furniture carved out of blocks of mango and cedar wood, soft natural colors, large lamps made out of palm fiber, private verandhas with daybeds, open sky outdoor shower and a constant ocean breeze that flows throughout. Ideal place for a quiet, natural and stylish holiday. This is the kind of place that invites you to perfect the art of lounging and relaxing. Styled by acclaimed Milan furniture and interior designer Marzia Chicherretti. Marzia’s style has been described as tropical contemporary, her furniture is hand made in Kenya using homegrown materials and locally-trained talent. Che Shale attracts people in search of a quiet, natural and stylish setting for their holiday. This is the kind of place that invites to perfect the art of lounging and relaxing. 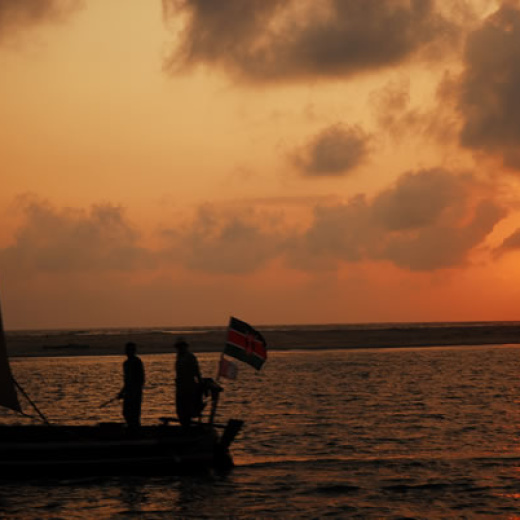 We are also known for being the first and best kitesurf spot in East Africa. Under the large palm thatched roofs, oversized cushions and comfortable daybeds invite to relaxation. In your room you will find unique furniture carved out of blocks of mango and cedar wood, soft natural colors, large lamps made out of palm fiber, private verandas with daybeds, open sky outdoor shower and a constant ocean breeze that flows throughout. Che Shale Restaurant is known on the Kenya coast for its fresh seafood, grilled meats, home made pasta dishes, tropical fruit platters, fresh-baked bread in safari style tin trunk, and other home-made specialties like seaweed in batter (picked up fresh from our beach), and spicy chilli jam. You will find some of the following dishes on the menu: Zanzibar style calamari, grilled mixed seafood platter, crab and coconut soup, grilled lobsters, fresh catch of the day ceviche, various meat and seafood stir-fries, penne crab, spaghetti vongole, greek salad, passion fruit cream, coconut pudding, and many many more. Excellent stay - nice refreshing few days away from the hustle and bustle of reality. And Harrison is by far the best bartender I’ve found in Kenya - makes the best dawa! The bathroom/shower and sheets/bed didn’t feel as clean as they could’ve but it was a rustic feel and I did opt for the budget side of things.